The two are synonymous and better known as the Satanic and systematic destruction, dismemberment, and murder of God's most precious part of creation, which is a human life. I know just wrote this on my Facebook page today. Sorry for the redundancy, but this is too important and cannot be emphasized and underscored enough, IMHO. I know, I know -- I'm just another Christian going on-and-on about abortion again like it's the only issue of concern here in America. It's not, but as someone recently commented, when you see the modern day equivalent of Auschwitz with your own eyes and ears, well, I don't care if you're "religious" or not, because I still believe in the objective truth that there is "right" and there is "wrong" in this world. 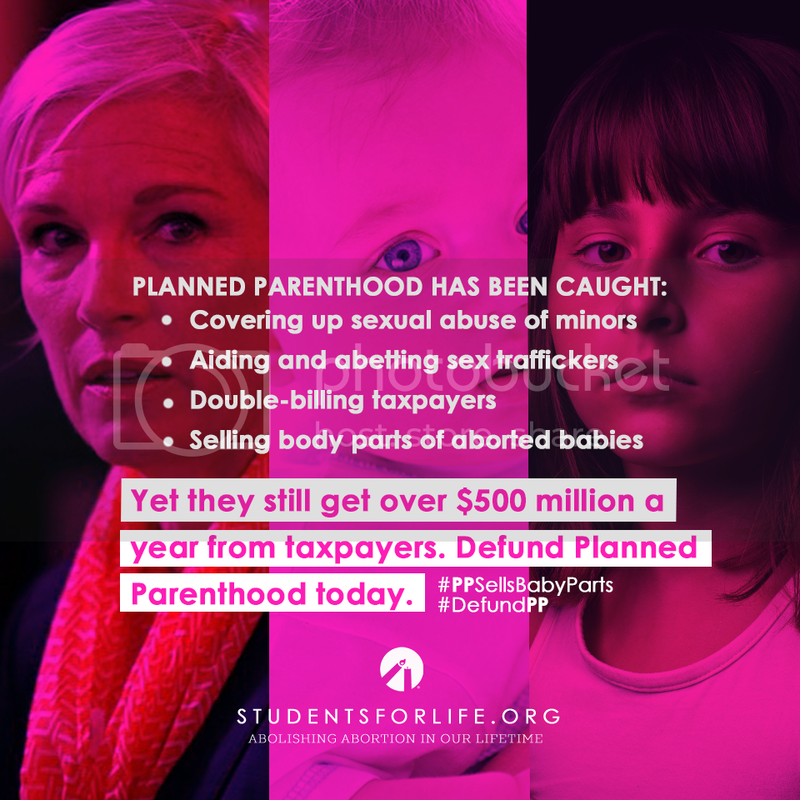 What Planned Parenthood has been caught doing more than once now is flat out wrong. No, it's pure evil. While the most vocal abortion/"pro-choice" supporters I know may continue to choose to remain silent about all of this (demonstrating a complete lack of common moral decency), I will take comfort in the fact that God is not silent about it. Martin Luther said, "You are not only responsible for what you say, but also for what you do not say." Indeed. Look, we may not be able to ever legislate morality in this country, but we can sure as heck legislate a way to defund immorality. Finally, to anyone who's reading this who has had an abortion, please know that there is forgiveness, healing, hope, mercy, and restoration through repentance and faith in Jesus Christ who died upon the cross for your sins and mine. Through His death and resurrection, His free gift of grace is for you as well. Sorry, but I felt compelled to write about this topic again after reading about the latest video that was released to expose the downright demonic practices of Planned Parenthood. As if that weren't bad enough, the deafening silence from the liberal, pro-abortion, pro-choice crowd has been maddening to me! But don't worry, at least they have their priorities in order. 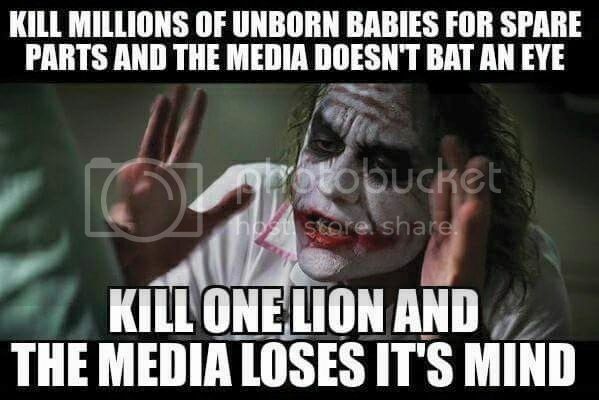 After all, the unexpected death of a lion by the hands of a hunter in the African wild is apparently much more important than the intentional death of a defenseless baby by the hands of a butcher in a so-called "civilized" country we call America. Yes, I'm afraid we've officially lost all common sense and plain old moral decency in this country (although it didn't just happen with this juxtaposition of news stories since they only serve to underscore this sad reality here in America). By the way, the whole "Donation For Medical Scientific Research Purposes" defense is even more absurd too, because a "donation" of any kind never involves a "negotiation" when it comes to the cost/price. What a sinful world we live in, huh? Lord, have mercy! Lord, come quickly! For additional comfort and prayerful reflection, please read the official response from LCMS Synod President, Rev. Matthew C. Harrison, in its entirety. Jesus warned us about this. He reminded us that the devil would be hard at work, seeking to devour hearts and minds. He told us the world would try to silence His Word of life, and that His truth would be shunned. Satan will stop at nothing to rage at Christ, even if it means murdering the tiniest of people and selling their bodies for profit. But God is not silent. He has a word for us, too. He comforts us in the knowledge that the devil’s attempts are desperate and futile, for Jesus came to save people, regardless of their size. He reminds us that He has “overcome the world” (John 16:33) and “came that [we] may have life and have it abundantly” (John 10:10). His point? Satan is fighting a losing battle, and he knows it. In a Lutheran layman's terms, "Satan will roar for a time, but his evil, murderous ways won’t last...for Satan cannot win, and God is not silent." Rev. Basil Christi: "While what happened to Cecil, the lion, is noteworthy, I think it's definitely far more important to take notice of what is going on with Cecile, the liar, as she tries to defend Planned Parenthood from being defunded."